But, I must admit to having been underwhelmed. Her work is odd and didn’t really seem to be odd in a good way. Though the works were paintings in that they were painted they seemed more like drawings and pretty crude ones at that. So in March I had a fairly brief look around the Wylie and thought maybe the next exhibition will be better and went on to look at the permanent collection. So, I thought I should go back for another look particularly as I couldn’t think of anybody else’s work they remotely resembled– that has to be worth something. So today I watched the video – an afternoon with Rose Wylie by Adolfo Doring and spent some time looking at the paintings trying to understand them; it was all made enormously much easier because I ran into Myles Calvert there. Myles is a brilliant print maker who has been working as a Tutor at Sussex Coast College– he was responsible for the Toast Exhibition we had at the college. He said they had grown on him. So apart from the Guardian and the Jerwood itself, that’s three people I knew giving them a kind of endorsement. Then Myles explained the painting Getting Better with Water as Wylie had explained it to him at the private view. The painting is in four parts and it is about her friend Louisa who was undergoing chemotherapy and needed rehydration because apparently chemotherapy leaves you dehydrated. The painting can be considered in a clockwise direction the top right segment shows Louisa looking thin and dry; in the bottom right segment we see her looking more hydrated; she is then contrasted in the other two segments to the Olympic swimmer Rebecca Adlington – with the broadness of her shoulders there is possibly a reference to Wylie’s own desire for broad shoulders. The names of Louisa and Rebecca are there, scrawled on the painting; originally an aide memoire that got incorporated. Many of her paintings do incorporate text but apparently with this one she had not intended to do so at the outset. Something is going on with those trees. I found the painting had the ability to take me back to being a child. When I was small I apparently showed my Dad a drawing “ that little girl is going to be surprised in a minute” I said; he asked me why; “because there is a lion behind that tree.” There was no hint of a lion to be seen. So I think I understand where Wylie is coming from; she hasn’t lost the ability to see the lions. Interesting. I came away delighted with the Jerwood, but sorry that I didn’t feel connected to her paintings for similar reasons to you. The video helped a bit. Thank you. What an interesting post…. I can see what you mean. I really like her, but not necessarily all of her work. Is there an interview on YouTube I wonder? Great video thank you for posting it. 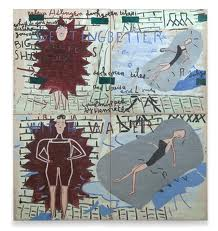 I haven’t seen a YouTube video of the interview with Rose Wylie – perhaps the Jerwood will put one up. I am totally not taken in by these paintings , just cannot see any value in them and do not believe the hype.